Pregnancy, weight gain, and weight loss can leave many with stretch marks and loose skin. Fortunately, a tummy tuck can partially remove stretch marks! Stretch marks are a form of scarring, caused by a tearing of the second layer of skin (the dermis). Stretch marks are caused by stretching of the skin, associated with rapid growth, such as weight gain or pregnancy. During a tummy tuck, excess fat and skin is removed from the abdomen. The procedure tightens the abdominal wall muscles, as well as improving the shape and general appearance of the abdomen. Tummy tucks can be very effective at removing the loose skin that may appear after rapid weight loss or pregnancy. Dr. Pirani offers a mini tummy tuck, or a traditional one depending on the patient’s needs. Dr. Pirani will work to create the best possible approach, in order to minimize scarring and maximize results. Recovery time after an abdominoplasty ranges from 2-6 weeks. Swelling may occur, and you will be provided with a compression garment. 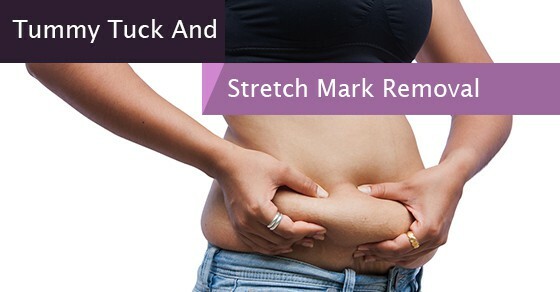 How Can a Tummy Tuck Remove Stretch Marks? If you have stretch marks below your belly button, you’ll be pleased to know that a tummy tuck can fully remove those scars. Since tummy tucks are limited to skin below the belly button, only stretch marks beneath the belly button can be completely removed, such as on the hips or lower abdomen. Stretch marks above the belly button may fade, as the skin is pulled downwards. If you want to remove stretch marks around the low abdomen, as well as improving the look of your abdomen and waist, a tummy tuck is certainly a procedure to consider. Since a tummy tuck is a surgical procedure there are many considerations, contact Dr. Pirani to schedule an individual consultation, during which Dr. Pirani will go over the procedure, as well as outline any possible risks or complications, and let you know what you can expect in terms of results and recover. Stretch marks can take a toll on your self-esteem. Call Dr. Pirani to look and feel your best!